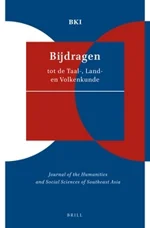 Published since 1853, Bijdragen tot de Taal-, Land- en Volkenkunde/Journal of the Humanities and Social Sciences of Southeast Asia (BKI) is an interdisciplinary journal on Southeast Asia, with a strong focus on Indonesia. In 2007, it was rated ‘A+’ by the Asian Studies Association of Australia (ASAA). This is a full Open Access journal, which means that all articles are freely available, ensuring maximum, worldwide dissemination of content. Published continuously since 1919, the New West Indian Guide (NWIG) is the oldest scholarly journal on the Caribbean, featuring English-language articles in the fields of anthropology, art, archaeology, economics, geography, geology, history, international relations, linguistics, literature, music, political science and sociology, and includes the world’s most complete review section on Caribbean books – covering some 150 books each year. NWIG is a peer-reviewed journal and regularly publishes contributions by authors from Brazil, Canada, Colombia, France, England, Germany, Guyana, the Netherlands, Suriname, the United States, and Venezuela, as well as every part of the insular Caribbean. This page provides an overview of the journals published by Brill Academic Publishers in collaboration with KITLV/Royal Netherlands Institute of Southeast Asian and Caribbean Studies.